Staff from the Management Body of Mount Parnon & Moustos Wetland* record biodiversity in the protected area. Especially for mammals, such as jackals and otters, the recording is quite challenging, since they avoid human contact or even human presence indicated by human odour. * In 2018, the geographical remit for this body was made much bigger, hence the new name to include Mainalon and Monemvasia. Honeyguide has funded two cameras to be positioned in suitable places, e.g. animal runways, on which filming is triggered by motion detected by an infra-red beam. News, October 2012: George Tryfonopoulos, biologist working in the protected area, reports success with the cameras, recording jackal and otter. Infrared, night-time images are tricky to make out, but here's an otter recorded recently; better still is the golden jackal, below. November 2012: see otters moving and approaching the camera on YouTube here, and golden jackals Canis aureus here: towards the end of the sequence there are jackals filmed in daylight, including cubs. Be ready to turn down the music! December 2012: a badger in front of the camera for many minutes. The Honeyguide group in spring 2012 is on YouTube here. Look out for familiar faces. 'A group of 16 nature lovers from England visited, and were given a guided tour of the environmental centre of Kastanitsa as they were in the area of Moustos wetland on Saturday 28 April and Wednesday 2 May. 'The group stayed in Livadi, Kynouria and their itinerary included Paliochora, Prastos, Kastanitsa, Tsitalia and the bay of Fokianos. 'During their visit to the Kastanitsa Environmental Centre they were informed by the guide about the unique flora and fauna, Byzantine monasteries of the wider Parnonan region as well as the Tsakonikan dialect and the architecture of the area. continued, right hand column. See updated logo and name in the left column. 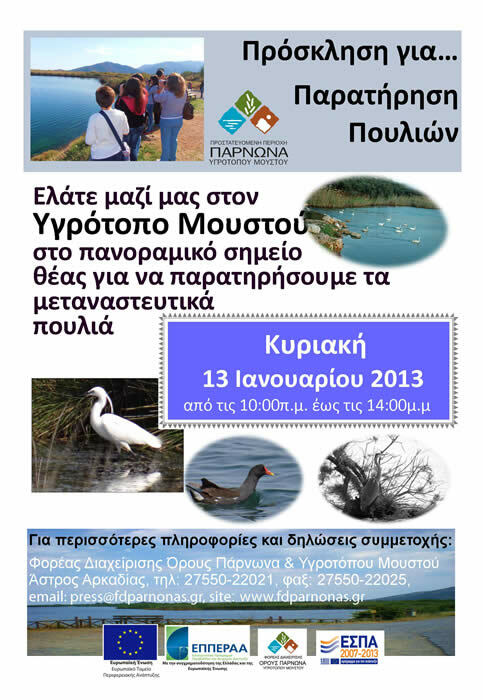 Poster promoting a birdwatching event at Moustos Lake on 13 January 2013, which attracted birdwatchers of a range of ages (left). Two Bushnell Trophy Cam Trail Cameras (as below), with security cases and camera supports, were bought from The One Stop Nature Shop at Burnham Deepdale in north Norfolk. We're grateful to proprietor Richard Campey for his help. November 2012: two more of these are on their way to Greece — an early delivery for our conservation project for the holiday in April 2013. Infrared camera kit about to be handed over, May 2012. 'On Wednesday 2 May the group visited Moustos and the hill Kastraki (little castle) to observe the wild flora and fauna. The guide, biologist and two rangers from the National Park accompanied them around the wetland. 'The guided tour finished with a distribution of information leaflets and Honeyguide Holidays committed themselves to returning to the area in the near future with the next group of travellers.